Earlier this week, the UNA board received a presentation outlining how UBC would be converting the entire campus-wide heating system from steam to hot water. As part of this, a new Hot Water Plant is to be built at the corner of Thunderbird Blvd. and East Mall. The proposed location for a central Hot Water Plant at the corner of Thunderbird and East Mall. The switch represents possibly the biggest single part of UBC’s short-term and long-term sustainability efforts. It’s forecasted to reduce energy demand by 24% and GHG emissions by 22%, and “cement UBC’s reputation as a world leader in sustainability and energy management.” One big advantage of using hot water is the ability to turn it off in the summer when not needed, unlike the current steam system which must remain on all year. If there are engineers or a VP Finance, Resources & Operations reading, please fill us in on what other advantages of hot water systems are. The trend for having massive glass faces on buildings will have reached a new level of craziness if a hot water plant needs floor-to-ceiling glass. Converting the whole campus from steam to hot water will happen in 9 phases over a period of 5 years. Phase one conversion is supposed to start this summer. One fun thing in the technical map is that it confirms the location of the one and only steam tunnel on campus. It runs along University Boulevard from Angus to the Aquatic Centre, then takes a turn to the south, ending at Woodward. Unfortunately, we have it on good authority that it’s fairly boring and cramped down there. 1) Safety. You do NOT want to be near a high-pressure steam line when it bursts. A boiler? Also not fun. Low-pressure warm water? Bring your rubber ducky. 2) A warm water system should be modular and can have sources everywhere (with geothermal, likely some solar, hopefully the ice rink refrigeration units, and probably recapturing heat from sewage), and the heat is then shared. Resurfacing a street? Add geoexchange piping underneath, connect it to the basement of a nearby building, and install a refrigerator-sized heat pump. The proposed building is to handle peak loads, and possibly to circulate the water. 3) If I remember correctly, as of a few years ago they had one boiler that was too old to really feel confident about using, two that were on the verge of hitting that point, and a fourth that was a bit newer and definitely had more than a decade of life left. And these dangerous, high-pressure boilers with all the huge methane burners were in 1920s and 1940s(?) earthquake traps that would be difficult to retrofit while the boilers were active. The thinking ~3-5 years ago was that the steam plant would have to be replaced imminently, and in its entirety. This does that. 4) Land is freed up in the campus core at the expense of a parking lot out on the periphery. 5) In the case of geoexchange, it should work best if you pump heat back into the ground in summer, so air conditioning comes along for the ride. 6) I think almost every building has its own huge steam-powered boiler. A heat pump is not huge. Space should be freed up, and future buildings should become cheaper to build. 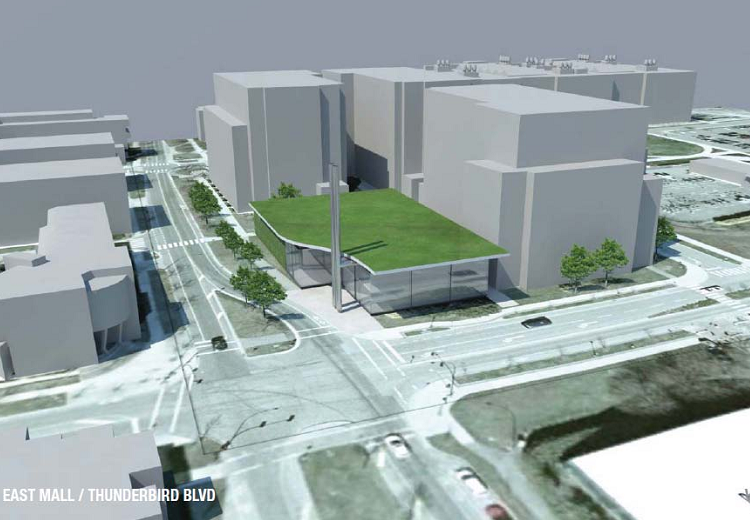 It looks like the proposed building has a green roof and green walls, with large windows on the south side sheltered from summer sun by an overhang. This should be an extremely low-energy building design.